Umlani Bush Camp is an exclusive rustic lodge accommodating only 16 guests in en suite reed and thatch rondavels. Early morning and evening game drives are in open four wheel drive vehicles accompanied by experienced rangers and trackers. With a traversing area of more than 10000 hectares, over 40 mammal and 350 bird species, this is a wonderful wildlife experience. Umlani makes the whole event personalised and specialises in guided walks into this unspoilt wilderness. Take your walk on the wild-side tracking the Big 5 on foot and experience the thrill of following big game off-road in open Land rovers guided by our knowledgeable rangers. Lion, leopard, elephant, rhino, and buffalo are all there along with cheetah, giraffe, zebra and many species of antelope. Walks, day and night drives give you the complete wildlife experience. You’ll become involved with game big and small, the prolific birdlife and be fascinated by the diverse tress, flora and fauna. Enjoy a spectacular sunrise deep in the bush before returning to the camp for a hearty breakfast. Spend the heat of the day with a cool box of refreshments at one of our hides watching birds swoop down to the water and mammals materialising out of the bush. Or maybe laze in hammocks around our splash pool sipping iced drinks. During your evening drive, watch the white light of the moon take over from the flame-coloured sun while enjoying sundowners surrounded by the unique sounds of the African wilderness. At the end of your spotlighted night drive return to the welcoming comfort of Umlani, a bush camp in the tradition of old Africa, with the romantic glow of paraffin lamps to light your way. Enjoy pre-dinner drinks in the convivial bar overlooking the Nshlaralumi river course or around a roaring fire in the boma and watch our chef put the finishing touches to the dinner he has prepared on an open fire. The aromas will make your mouth water and you’ll be more than ready for a candlelit dinner accompanied by fine South African wines, while swopping stories and sightings with your fellow adventurers. Your comfortable en suite reed and thatch rondavel is calling but before falling into bed, take a steaming hot shower under a blanket of wondrous stars in your own open-air reeded bathroom. The magic is complete when the haunting sounds of nearby hyena and lion lull you to sleep. These rates are all inclusive. Accommodation, all meals, games drives and drinks. I can highly recommend Umlani to anyone looking for a true African Safari. While we were there we spotted the big 5 and more including a cheetah. The weather was beautiful (we went late March) and the surroundings are absolutely stunning. 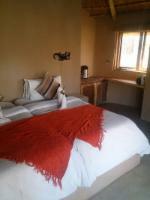 The lodge is also stunning and in a great position overlooking the riverbed. At night you can hear numerous animals and the reserve is also great for bird watchers. Umlani was a very exceptional experience. We met a very professional manager and team. The catering and game drives were outstanding. The accommodation was very interesting and very close to the nature. A bit of a damper was the green pool that we could not use, as well as the professional ranger and tracker talking more among themselves than with us, and the continuous private conversation was quite disturbing. From superbly prepared food with local flavors to impeccable service with personal touches and, of course, plenty of game sightings. We were thoroughly impressed with our visit. We took our two boys, ages 13 and 15, and they loved the place. We love our 5 Star hotels in the big city but Umlani is the perfect way to experience the bush. We loved every minute of our three nights at Umlani. The hosts were warm and welcoming, the accommodations very comfortable, and our ranger, Ginger, was phenomenal. Sitting on the deck and watching the waterhole in the afternoon as the animals took their turns to come for a drink was also spectacular, and the highlight of our visit here was watching the buffalo stampede into -- and out of -- a water hole, from the perspective of the tree house, followed by a family of elephants who wanted the water to themselves. Magic. Umlani Bush Camp Timbavati Game Reserve is 58.6km from the centre of Timbavati Reserve , the nearest airport 83km (Eastgate Airport).